That's my closet? -- one of Stephanie's sons, looking at the "after"
Remember Stephanie (who knits some amazing jewelry) and her office closet make-over? 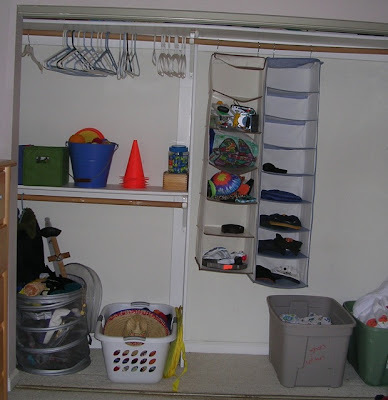 Here's the next project we did: de-cluttering and organizing her boys' bedroom closet. Pretty dramatic change, huh? No wonder her son was shocked! 1. We removed the sliding doors that were very hard to move. No wonder the closet got out of control; it was a struggle to open the doors, even for an adult! Stephanie could stick with the no-door look, but she's also thinking about adding a curtain rod and some sort of curtain. 2. We de-cluttered. The photo above shows what got removed from the bedroom - and most of that had been in the closet or dresser. We got rid of the clothes the boys had outgrown, or just didn't like. 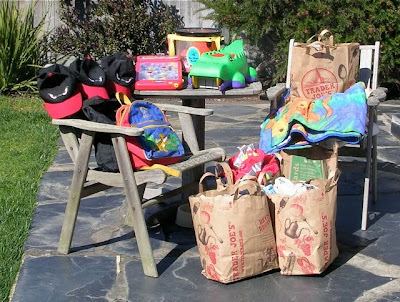 (We donated them to a local thrift store, or gave them away to other people with small children.) We also got rid of the beat-up linens; they went to the local humane society. 3. We looked for the easiest possible storage possibilities for things that are used on a regular basis. With two boys sharing one dresser, not all the clothes fit in there, so we added a bin on the closet floor to handle one boy's undies and pajamas. That's easier than trying to fit them into those hanging sweater shelves; the younger boy couldn't even reach the top shelves! Another bin, tucked away in a corner, holds spare linens. Some sentimental quilts got stored on the top closet shelf. 4. Again, we made do with the storage products we had. OK, Stephanie is going to buy two more big bins for the closet floor - one for the jackets and sweaters, and one to replace her laundry basket that is serving as a bin. But those are minimal purchases, and products that can get re-used in numerous ways over the years. Stephanie would also like to have shelving built in on one side of the closet - a relatively inexpensive project - but for now, we made due with those hanging sweater shelves for storing miscellaneous smaller items: baseball caps, a belt, the Disneyland stuff. 5. We put like with like, in appropriately-sized containers. Things went so well with the closet that we carried on and decluttered and organized the top of the dresser, the bookshelves, and the toy bins. 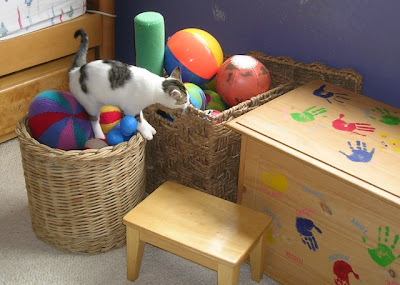 In the closet, you'll see a bucket that now holds small balls; they used to get buried in the larger toy bins. The bins above hold larger balls, including some that Stephanie knit. The toy chest holds a few larger items. 6. We didn't freak out at the mid-project mess. 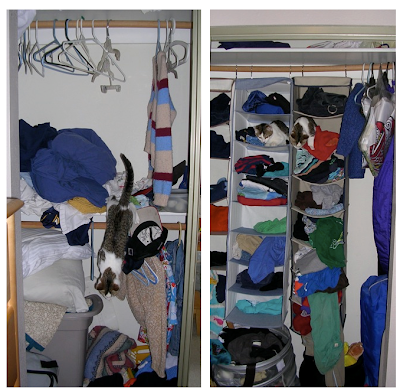 We'd pulled things out of the closet for sorting - so for the short-term, things looked worse, not better. But the end result made everyone happy! Many thanks to Stephanie for agreeing to share her experience - and these photos - with all of you. looks like you had some great "helpers" (the kittys). theyre very cute. the closet looks so much better. Great before and after pix! Isn't it amazing how much space there is once you get rid of what you don't need/want? I need to do that!! I'm so glad you posted a picture of the mid-organizing mess! 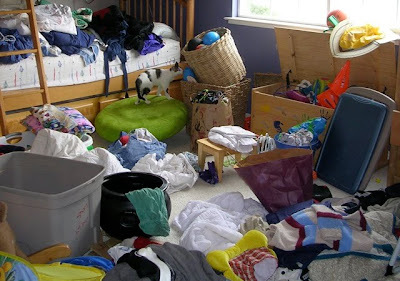 For some, the mess that happens while organizing is a real stresser. I reassure my clients its a natural part of the process - I call it the storm before the calm. 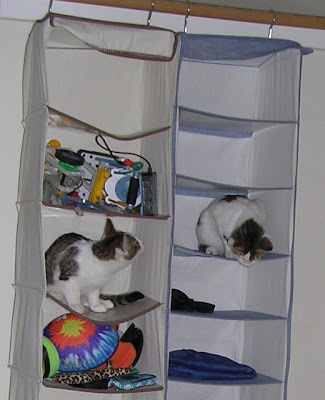 OK, I'm officially loving the cats, especially the photo of them tucked into the sweater organizer. Seeing the photo of the "mid-organizing mess" definitely makes me feel better about my own experience. I have photos of my old living room that look so chaotic, but I had to bring my stuff out of hiding (drawers, closets) before things could get better. It can be overwhelming, but it's all part of the process. I just looked at my photos again, and it's a great feeling to be reminded of how much progress I've made. I suspect Stephanie will be happy to have hers as a visual reminder, too. Thanks for sharing! Chantal, I was amazed at just how much space there was when we got rid of the stuff that really had no use any more! Sophie and Simpler Living, Stephanie suggested that I take the mid-organizing mess photo, and I thought that was inspired! Things often do look worse for a short time, and that can indeed cause concern. When I worked with a feng shui consultant to re-position things in my office, things definitely got worse in mid-stream. The consultant commented on how calm I was; many of her clients get nervous at that point. But to me, it was just like an organizing project, and I knew we'd be fine in the end. Sliding doors on wardrobes are such a great idea - in theory. We have lovely floor to ceiling mirrored doros and they are the bane of my life. They slide easily enough, but since there's only two, the middle section of the wardrobe is a 'no man's zone'. It's very tempting to remove them; maybe attach them to a blank wall and have an open wardrobe. SueBK, I also have mirrored sliding closet doors. Fortunately, the two doors in mine have quite a small overlap, so I can still get to the middle area easily. You could always try removing yours, and see if you like the look. Fantastic pictures. The kitties are adorable. Like others said, the mid-project picture is priceless. As usual, you did an amazing organizing job. What a difference it made and I am sure the boys will be much happier in the new space. So far so good - the boys are better at putting their things away (well, not today). 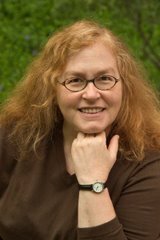 I would have given up without Jeri - that middle stage was overwhelming. Thanks Jeri! yes - organizing is one of those "gets worse before it gets better" activities. I *really* hate sliding closet doors. It seems no matter which side is open, it's the other side I need to get into. I think the only way I'll ever have them again is if they are outside the opening and can slide all the way to the side, like a barn door. I much prefer bi-fold or swing-out doors. You can get both with mirrors, and swing-out doors have the advantage of being able to use the inside of the door as well. And again, such well organized kitties. We had sliding doors on our bedroom closet in our last home, and they were constantly getting stuck or popping off the rail, so we decided to just remove them. It made it so much easier to access everything! The only downside was that things that didn't get worn very often tended to get a little dusty - but on the other hand, that helped identify things that we could perhaps let go!